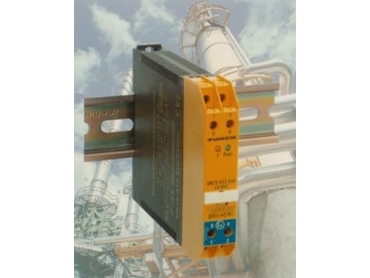 TURCK has announced new MK72 intrinsically safe solenoid drivers to isolate and power loads in classified hazardous areas. These new models provide current and voltage that is much more specific to the needs of intrinsically safe solenoid manufacturers and users. The MK72 is available in fourteen different models to provide output circuit voltages of 12, 16, 18 22, 24 or 26 VDC and output current of 22, 32.5, 37.5, 40, 42.5, 45, 57.5, 62.5, 65, 67.5, or 70 mA, depending on model, to meet the needs for intrinsic safety applications. The output circuits and the 19-29 V dc inputs are galvanically isolated from each other, eliminating the need for external grounding. Additionally, the extra power delivered to the hazardous area also makes intrinsically safe LED pilot lights shine brighter. Designed for OEMs and end-users with solenoid valves and IS pilot lights, the newest additions to the multimodul MK Series measure just 18mm wide, offering superior packing density and requiring only half the space used by many drivers. Other features include green LED indication for "Power ON," and yellow LED to indicate "Output ON." Full-size screw terminals and DIN-rail mounting allow quick and easy replacement. MK72 Drivers are FM and CENELEC approved for Class 1, Division 1, Group A. Sensit 03 9807 7711.